Brendan McKay does not have any MLB stats for the season. Draft: 2017, Tampa Bay Rays, 1st rd. 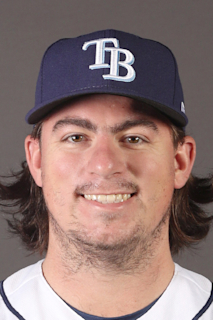 April 1, 2019 LHP Brendan McKay assigned to Montgomery Biscuits from Charlotte Stone Crabs. March 5, 2019 LHP Brendan McKay assigned to Tampa Bay Rays. September 15, 2018 Charlotte Stone Crabs activated 1B Brendan McKay from the 7-day injured list. August 30, 2018 Charlotte Stone Crabs placed 1B Brendan McKay on the 7-day disabled list. July 18, 2018 Charlotte Stone Crabs activated 1B Brendan McKay from the 7-day disabled list. July 9, 2018 Charlotte Stone Crabs sent 1B Brendan McKay on a rehab assignment to GCL Rays. June 19, 2018 Charlotte Stone Crabs placed 1B Brendan McKay on the 7-day disabled list retroactive to June 15, 2018. May 14, 2018 1B Brendan McKay assigned to Charlotte Stone Crabs from Bowling Green Hot Rods. April 2, 2018 DH Brendan McKay assigned to Bowling Green Hot Rods from Hudson Valley Renegades. July 16, 2017 1B Brendan McKay assigned to Hudson Valley Renegades. June 28, 2017 Tampa Bay Rays signed 1B Brendan McKay.